One small press I don’t hear much about but is very very good is Sunnyoutside, run by David McNamara in Buffalo, New York. David does an amazing job – producing beautiful little chapbooks from writers you may haven’t heard of. 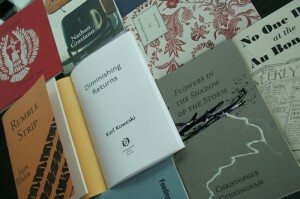 Recently, David’s been doing paperbacks, which he plans to do more of in 2009. For next year, in paperback, we can expect books from: Tim Horvath, Nathan Graziano, William Taylor Jr., Chelsea Martin, Curtis Smith, Brian McGettrick, and Rebecca Schumejda. Also, a plan to get solid distribution to get more of these great books in people’s hands. David keeps everyone up-to-date on Sunnyoutside happenings at the website.